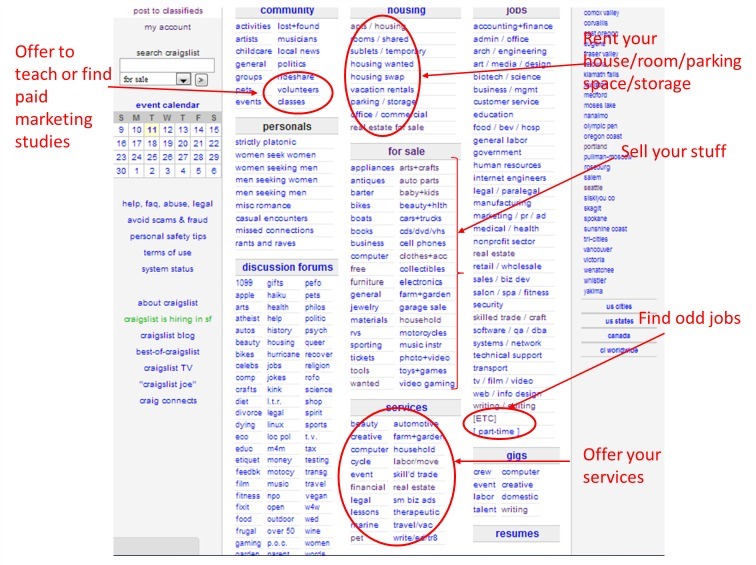 Tips to help you when advertising on craigslist and posting multiple ads. When using an image ad in multiple categories you should have a folder on your computer with multiple copies of the image ad with different file names. Simple copy the image and rename it x10. Now you have 10 unique image ads. So alternate the image name when uploading image ads. Be sure and ad some text to your image ads. Having 15 or so words on the ad will keep your ad safe from being automatically (assumed) seen as spam by craigslist. Always ad a little text then upload your image. Your professionally designed image ad will steal the show. If you are using a text only ad, keep it short and to the point. Do not ramble on about irrelevant information. Say what you have, how it helps the reader, and how to get it. Do not get frustrated when your ad gets flagged, and remember it is not always craigslist flagging your ad. It is a user that flags it. Just repost your ad a few hours later. Advertise in the right categories for what you offer and where you think your audience is. I sometimes drop an ad in category hoping to reach the people advertising in that category, not necessarily the “people” reading the ads meant for that category. It works for me…. Use a phone number on your image ad if you want to drum up real business. Talking to people by phone is 100x’s more effective in sales than emailing. Use an image ad when possible. You need to stand out in this copycat era of marketing and your own branded image ad will show you mean business. Share your tips – Leave a comment on this post! Buying and selling items on craigslist can be a great income source. A lot of people buy and sell second hand items on craigslist and make a good living at it. Craigslist has become a household name and has completely changed the local classified ads industry (or I should say shut down). There are many ways to make money on craigslist here is our top 10 ways to make money on craigslist. Run an ad that says you buy “stuff” or buy out houses full of junk. Remove junk for free or a small fee, sell the vintage items you find or buy on sites like eBay for a profit or relist on craigslist at a profit you can also us local yard sale pages on Facebook. Many times people need money NOW and will accept very low offers. If you can tie up your money longer than them, you win! You can make money daily like this on craigslist. Provide a local service like Pet Sitting, Home Sitting, Elderly Check-Ins, Small Maintenance Jobs or Odd Jobs. Advertise on craigslist in the services section in multiple categories using a Craigslist Image Ad. Advertise you buy used and broken iPhones & Smart Phones and resell them to companies that repair smart phones and cracked screens. Check out the prices you can get for used and broken phones on Ebay and online. Very lucrative craigslist business. Buy and sell local domain names. Find YourTown.com domains like “DallasLandscaping.com” and list it on craigslist for sale. Selling local keyword rich domains on craigslist is a good business. You can sell a domain name or $500.00 and it only costs $9.95 a year to register them! Offer to help people sell their cars online. Advertise you can get their car sold fast. List the car for sale on craigslist and other local sites and on facebook using an image ad and take a 10% marketing fee after the sale! I have a friend that does this and sells 5-10 cars a month and makes some pretty good extra money. Offer computer/internet training to seniors or computer/internet challenged folks. Charge $125.00 for a 2-3 hour class you will find a lot of people will refer people to you for this. Many people are lost when it comes to even getting on Facebook. You can sell your basic knowledge. You will need a laptop/PC and be good with people. Use craigslist as a lead machine – There are so many people/businesses advertising on craigslist, they all need more business! You can call businesses that have craigslist ads and offer them the service of advertising their business for them on multiple sites, categories, facebook, and more. Sell advertising services to those advertising on craigslist. Organize a craigslist meet-up group where people meet to sell and swap vintage items and valuables – Get a small venue and charge an entry fee. It is like a private swap meet. Lots of these meet-ups happen all the time in my area. They also advertise the meet-up on Facebook. Barter your way to riches. The barter section on craigslist is a great place to start trading and bartering your way to $$$. Always get the better end of the deal and you will be able to trade your way up the latter and cash out the big ticket item you trade up to. There are storied of guys trading an xbox all the way up to a new $6000.00 pick-up truck and other successes. Be creative and do not be scared to walk away from a deal if you are not getting the better end of the trade. Offer to remove appliances and metal/scrap debris fro homes and properties. Scrap yards pay by the pound for junk metals a few truck loads can be a nice paycheck. Separate your copper and brass to get more for your money. These are just a few ideas off the top of my head on how you can make extra money using craigslist. Never be afraid to try a new idea out and never be shy when dealing with people! As always if you need an ad designed to use on craigslist give us a call and we will help you get your message out! Have a craigslist business idea – share it below! Leave a comment!